An installation usually happens quickly—one day it’s not there, the next it’s installed. But Slow Art Collective, represented here by Dylan Martorell and Chaco Kato, are interested in the act of making. 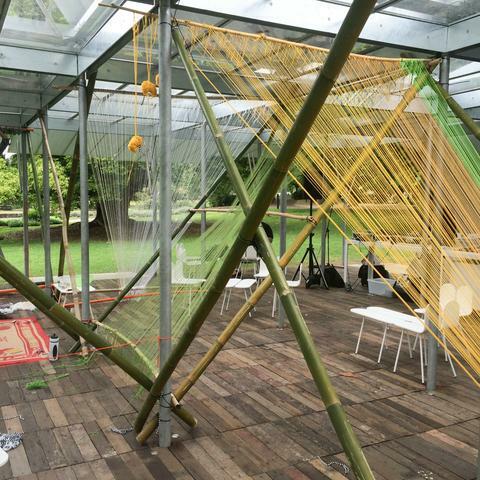 Over the course of a week they’ll be gradually gathering plant debris from MPavilion’s parkland setting to create an evolving installation, turning the pavilion into a living studio. 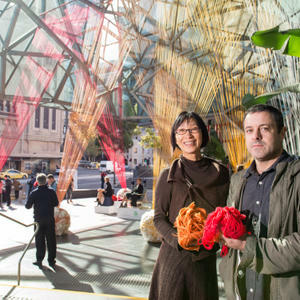 Leaf House Music is part of One Night Stand, a series of events that respond to MPavilion’s transient, temporary nature. These live artworks, ambient installations and sonic lullabies provide spaces for everyone to pause, rest and connect. And they explore the wonderful potential of the night—for romance, refreshment, dreaming and star-gazing. Click here to view our Facebook photo gallery of the completed installation.